Philly teachers OK new contract; now, how to pay for it? PFT President Jerry Jordan, surrounded by union staff and lawyers, speaks after members voted to approve a contract. The longest contract stalemate in Philadelphia School District history appears to be over, with teachers overwhelmingly approving a new contract worth $395 million Monday night after four bitter years. The three-year deal will mean raises for the more than 11,000 members of the Philadelphia Federation of Teachers, the city's largest union, though it will not make educators whole for five years of frozen wages. 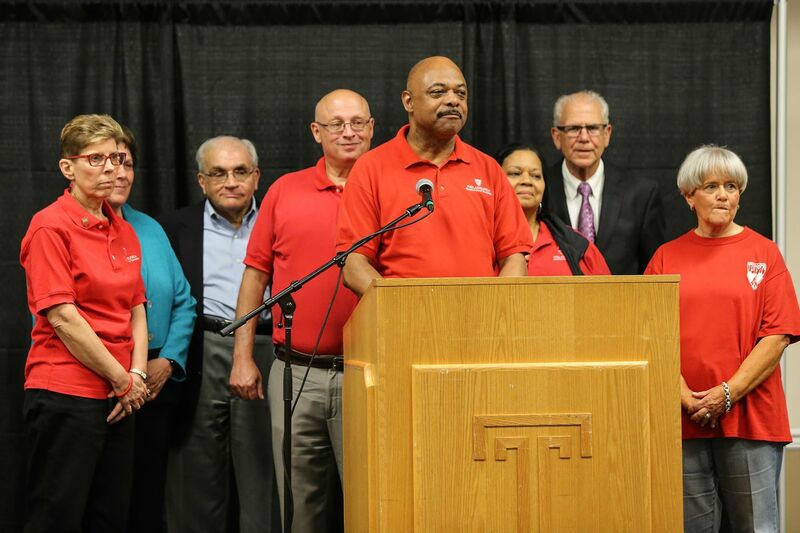 "We are really, really pleased about the agreement," Jerry Jordan, PFT president, said after a general membership meeting at the Liacouras Center of Temple University. But even as union leadership celebrated the vote — 95 percent of members who voted endorsed the contract — politicians made clear there is no plan in place to pay for it. And some officials in Harrisburg sounded ominous notes about their willingness to help foot the bill, which is $245 million more than the district has budgeted. A source close to the negotiations has said that the deal could mean teacher layoffs down the road. Republicans who control both legislative chambers in Harrisburg threw cold water on any expectation that the state would send Philadelphia more money to help it pay for the contract. "It makes it very difficult to take any request from Philadelphia seriously when they do nothing that appears to help themselves – and then they negotiate a contract which they admit is based on fantasy," said Steve Miskin, spokesman for House Republicans. Drew Crompton, the top lawyer for Senate Republicans, said he was flabbergasted by the move to approve a contract for which the district does not have the money. "I can't fathom the school board signing a deal that they fundamentally know that they can't pay for," he said. "It's perplexing." City Council President Darrell L. Clarke said that the contract brings needed stability, and that Mayor Kenney and Council would be looking at potential revenue in the next several months. It was clear to all parties that any multiyear contract would mean a gap in funding, Clarke said, as the district projects a deficit beginning next year. "We will be at the state's door, knocking on the door, asking them to meet us, help us meet this obligation," Clarke said. "I don't know how that will play out, but we're hoping." Kenney issued a statement thanking the union members for their endorsement of the deal. "I know full well that throughout this long and difficult process, you have remained dedicated to the single most important matter: educating our city's children. While I know this new contract does not make you entirely whole, I am confident that teachers, administrators and families will make greater strides in improving how our children learn and thrive in Philadelphia's public schools," he said. Superintendent William R. Hite Jr. welcomed the vote. "I am pleased the PFT has ratified our tentative agreement and that this tentative agreement will now go before the School Reform Commission for approval tomorrow," he said in a statement. "This is a contract which benefits our teachers, our students, and provides stability for the entire School District of Philadelphia." The contract does not give straight across-the-board raises, but does resume "steps," or pay for years of experience, and compensation based on advanced degrees. It gives teachers a combination of one-time payments, percentage bumps in salary, and movement in the step system to help recoup some of the years of pay raises they missed while the contract was frozen. Educators will also begin paying for their health insurance: 1.25 percent of their base salary in September, 1.5 percent in 2019. Under the current contract, brand-new teachers with no advanced degrees are paid $45,360. By the end of the new contract, they would make $46,267. Teachers at the top of the pay scale now max out at $90,051; that would rise to $91,852. There will also be some changes in work rules. In one concession, the PFT accepted universal "site selection," which allows principals to hire the teachers they want without considering seniority. Seniority will still guide layoffs and recalls. Outside the Liacouras Center, many PFT members said that they thought the contract was not perfect, but that it was the best they were going to get. "It's a good compromise," said Ninoska Wong Shing, a counselor at Farrell Elementary in the Northeast. "In an ideal world, I would get credit for all my years of experience and I would be getting all my retroactive pay," said Chrisostomos Argerakis, a music teacher at South Philadelphia's Andrew Jackson Elementary School. But, he said, this felt like a realistic deal, though he will lose out on tens of thousands of dollars. Argerakis has nine years of experience teaching, but has been paid as a fifth-year teacher. He works a second job on top of dedicating hundreds of unpaid hours to Home, a rock band made up of Jackson students. The Caucus of Working Educators, a group that has challenged Jordan's leadership, did not take a yes or no position on the contract, but said in fliers its members handed out as teachers walked into the Liacouras Center, "We don't believe the contract addresses most of the core issues that educators care about, and won't help create the schools that students and educators deserve." The caucus said it wanted to see movement on smaller classes, building issues, the arts, teacher-led training, and other issues. George Bezanis, a caucus member who went so far as to crowd-fund campaigns for a billboard on I-95 and a banner plane to call out city and district leaders on the contract stalemate, said he voted yes, although reluctantly. "There are some things that gave me pause," said Bezanis. "In the end, because we've pushed so hard for this, I did vote yes, but I wish there was a 'yes, but I don't like that, and I don't like that.'" Staff writers Angela Couloumbis, Julia Terruso and Claudia Vargas contributed to this article.